LOOKED AT FROM outside, Spain appears to be doing pretty well. Its strong economic recovery from the euro crisis continues, albeit at a slower pace than in the past. Unemployment, though still high, is down to almost half its peak. Bars and restaurants heave with tourists and with Spaniards who once again have cash to spend. Despite that, the country has just been proclaimed the world’s healthiest. Yet as the campaign gets under way for a third general election in little more than three years on April 28th, Spain’s underlying strains should give the voters cause for concern, even alarm. The first worry involves Catalonia and the aftershocks from the unconstitutional drive for independence by the regional administration there in 2017. This was contained, partly by judicial overreach. A dozen separatist leaders, nine of whom have been in jail for up to 16 months, are now being tried in the Supreme Court on charges potentially punishable by long prison terms. The trial has reinforced tribal loyalties. Polls suggest that some 2m Catalans still want to leave Spain. To many other Catalans and Spaniards, the separatists’ antics constituted an attempted coup that posed a deadly threat to their country. Catalan nationalism has thus revived its Spanish equivalent, largely dormant since the transition to democracy in the 1970s. 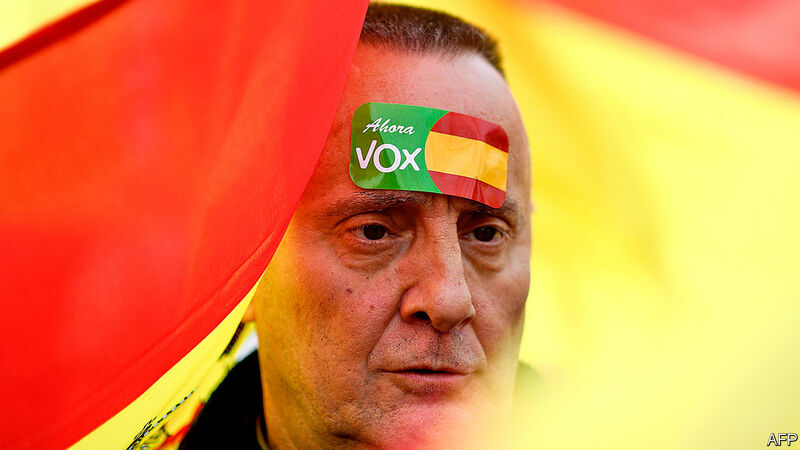 The ugliest manifestation of this, and the second worry, is Vox, a previously insignificant ultra-conservative party which rode anger about Catalan separatism and illegal immigration to win 11% of the vote in a regional election in Andalucía in December. Polls suggest it will do at least as well nationally in April. Nationalist and dismissive of gay and women’s rights, a little like the ruling Law and Justice party in Poland, Vox has pulled the mainstream conservative People’s Party (PP) and Ciudadanos, an ostensibly liberal outfit, to the right. Both Pablo Casado, the PP’s new leader, and Albert Rivera of Ciudadanos threaten to impose direct rule on Catalonia, which is only likely to increase support for independence. They have formed a coalition government in Andalucía that depends on the support of Vox. Vox is also a manifestation of a third concern: the increasing fragmentation of what was a stable two-party system. It is almost inevitable that Spain is heading for a third successive hung parliament. The problem is that the country still needs a strong, reformist administration. Little has been achieved since the PP lost its absolute majority in 2015. To sustain economic growth and social progress, Spain needs to reform education, training and the welfare state. Once the Catalan trial is over, Spaniards also need to rethink the vexed issue of how power should be divided between the centre and the regions. These problems would test even experienced statesmen. But all the main political leaders are young and relatively green. Though not faultless, Pedro Sánchez, the Socialist prime minister since June, has at least tried to ease the tensions in Catalonia. That, however, prompted howls of outrage on the right and ultimately helped bring down his government. The biggest worry is that the three largest parties—and especially the PP and Ciudadanos—are expending more energy on squabbling among themselves than in confronting Spain’s problems. Emotion and short-term electoral calculation are trumping the national interest. Given that the PP is still rebuilding itself after a long period in office, Spain’s best hope of reform lies in a coalition between the Socialists and Ciudadanos. It is disturbing that as the campaign began Mr Rivera ruled that out (see article). If the numbers prove not to add up for the Andalucian-style right-of-centre coalition Mr Rivera hankers after, his sectarianism risks prolonged political paralysis in Spain. And if he really believes that Mr Sánchez is a bigger threat to Spanish democracy than Vox, he should think again. The sleep of reason, as a Spanish artist once noted, brings forth monsters.